Aurelius Prudentius Clemens (A.D. 348-413), better known simply as Prudentius, was a Roman Christian poet, and of interest for today's feast, the Feast of Ss. Peter and Paul, is his poem, taken from his Liber Peristephanon (Book of the Martyrs Crowns), the Passion of the Apostles Peter and Paul (Passio Apostolorum Petri et Pauli). Now whenever I read Prudentius, I am always interested in what one might historically glean from him about early Christian Rome and I would draw your attention to the first two stanzas of this poem, as well as to the last eleven. 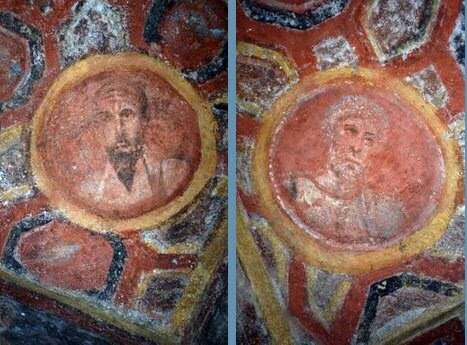 There we are given some sense of the festivities that occurred within Rome surrounding the feast of these two apostles. "More than their wont do the people flock hither today; my friend pray tell me why do they hurry throughout Rome rejoicing?" "Mark how the people of Romulus surge through the streets in both directions, for two feasts on this day are celebrated. Now with glad steps let us hasten to visit these holy sanctuaries, and there let us unite in hymns of joy. First we shall go by the road that leads over the mighty bridge of Hadrian, and later we will seek the stream's left margin. After the vigil the Pontiff officiates first across the Tiber, then hither hastens to renew the offering." Here then is Prudentius' full text.